Transformation & Revelation takes the viewer on a journey through the different elements of British theatre design from 2007 – 20011. In total there are 33 diverse exhibits in the Summerhall Gallery in Edinburgh, highlighting a variety of performances within different theatre spaces. The exhibition is presented in collaboration with the V and A museum and the Summerhall gallery makes the perfect venue for the assorted presentations, video installations, costume designs, photographs, sketches and scale models. The subtitle of the exhibition (Gormley to Gaga) eludes to Es Devlin’s exuberant set design for Lady Gaga’s Monsterball World Tour and Anthony Gormley’s designs for the Sadler’s Wells ballet – Sutra. Both these exhibits are presented as intriguing and compelling scale models that not only show the thought and contemplation that goes into creating such designs, it also presents how a visual artist sculpts in space and presents the fine line between performance arts and visual arts. Other highlights include Johanna Scotcher’s fascinating designs for The Railway Children and how she transformed Waterloo Station in London into a theatre space. 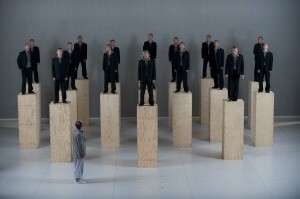 The claustrophobic Auschwitz designs for the opera Die Passagierin are a standout along with Connor Murphy’s designs for the opera Magic Flute. Here Murphy shows how a sparse and minimalist approach can enhance the enjoyment of a performance and captivate an audience. Another aspect, to the exhibitions endearment, is that it takes the audience beyond the stage and shows how a designer looks to tackle problems. This is explicitly shown with Richard Hudson’s innovative approach to designing for the ballet – Rushes: Fragments of a Lost Story. Here we see how Hudson utilised beaded glass curtains to reflect light and divide the performance space, while allowing the dancers to move across the stage and between the curtains. The only criticism could be that the presentation of the scale models and costumes will only make the viewer jealous that they never had the opportunity to experience the productions first hand. The exhibition takes the viewer into the theatre space and gives a comprehensive overview of the visual arts within the context of performance. Diversity, variety and presentation are the main strengths of Transformation & Revelation and the exhibition will immerse the viewer in these worlds regardless if you are a fan of the theatre, ballet, opera or any of the performance arts.